Nepal, a landlocked nation sandwiched between India and China, has traditionally relied on Indian ports for trade with other countries, as Nepal and India have enjoyed friendly ties since the 1950s. But now, the Indo–Nepal relationship looks to be undercut by China, after the latter announced a new trade agreement with Nepal. The Transit and Transport Agreement (TTA), signed after a meeting in Nepal’s capital Kathmandu last week between Nepali and Chinese officials, would allow Nepal to use four of China’s seaports and three land ports for trade, according to a Sept. 7 article by Nepal’s English newspaper The Himalayan Times. Nepal can now use the seaports in the Chinese cities of Shenzhen, Lianyungang, Zhanjiang, and Tianjin. Both Shenzhen and Zhanjiang are located in southern China’s Guangdong Province, while Lianyungang is located in Jiangsu Province, along China’s eastern coast. Tianjin offers the shortest distance of the four, about 2,050 miles (3,300-km) from Nepal’s border. The three land ports are located in the Chinese cities of Lanzhou, Lhasa, and Shigatse. The latter two are cities in Tibet and the former is situated in northwestern China’s Gansu Province. Under the agreement, Nepali traders will be allowed to travel by any mode of transport, such as rail and road, to access these ports. For the land port in Shigatse, Chinese authorities will provide permits for truck and container operators to carry cargo to and from the Chinese city to Nepal. The Himalayan Times article didn’t give an explanation why such a permit would be needed for Shigatse, but not for the other ports. China’s motives behind signing the TTA has since been questioned by Indian media. According to Indian news website Opindia, the transportation costs are going to be higher with using Chinese ports, compared to Indian ports, given the longer distance from the Nepali border. For example, the distance to Kolkata, the capital of India’s West Bengal state, is about 480 miles (774 km), and the distance to Visakhapatnam, a port city in the Indian state of Andhra Pradesh, is roughly 741 miles (1,194 km). The trade agreement is just one of a series of investments and projects that China has struck with the Himalayan country, as it is considered a strategic nation in its One Belt, One Road initiative (OBOR, also known as Belt and Road). Beijing first announced OBOR in 2013, a project to build up trade routes linking China, Southeast Asia, Africa, Europe, and Latin America. Beijing aims to finance infrastructure projects in over 60 countries. Since then, money and Chinese tourists have poured into Nepal. 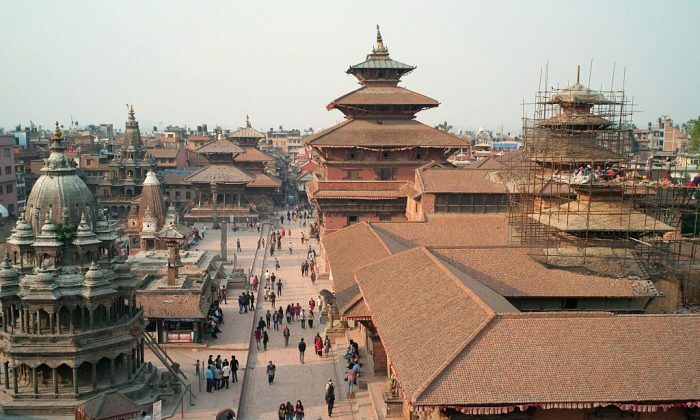 For the first three months of this year, the number of Chinese tourists visiting Nepal topped 40,976, outpacing Indian tourists for the first time, according to Nepal’s daily newspaper The Kathmandu Post. In terms of OBOR infrastructure projects, in April 2016, construction of the Pokhara International Airport in central Nepal began after Nepal’s Ministry of Culture, Tourism and Civil Aviation awarded the contract to China’s state-run CAMC Engineering. According to Xinhua, funding for the construction was provided by China’s state-run Export-Import Bank of China, which provided a loan of $215.96 million. Construction of the airport is expected to be completed in 2021. Then, in March 2017, China pledged $8.2 billion in foreign direct investment to Nepal, according to state-run China Daily. In June, the two countries signed eight investment agreements worth $2.4 billion during Nepali Prime Minister K.P. Sharma Oli’s visit to Beijing, according to India’s English newspaper Hindustan Times. Among the agreements are plans by Chinese companies to build a cement factory and several hydroelectricity projects in Nepal. There are also talks about building railways linking Kathmandu and Gyirong, a county in Tibet, according to a Sept. 9 article by China’s state-run newspaper Global Times. Chinese companies also have proposed to build a railway network in Nepal, including a rail between Nepal’s northeastern city of Kerung and Kathmandu. Construction costs are estimated to be at least $2.2 billion, according to an Aug. 26 article by Nepal’s English daily Kathmandu Tribune. With increasing Chinese investment, there are fears in Nepal that the country might fall into a debt trap, much like what happened in Sri Lanka, according to a June 20 opinion article published on Nepali English news site My Republica. In December 2017, Sri Lanka handed control to China of its main southern port located in Hambantota, after failing to pay back $6 billion in loans and converting the debt into equity. The port was an OBOR project. The article also pointed out how Sri Lanka’s Mattala Rajapaksa International Airport, a project under OBOR, is now the world’s emptiest airport and has incurred heavy financial losses. Nepal’s Pokhara International Airport might end up in the same situation, the article warned. “Before embarking on big projects under [OBOR], Nepal needs to carefully assess their possible impact on our economy,” the article concluded. Jagdish Chandra Pokharel, former vice chair of the Nepalese government’s National Planning Commission, also warned that China’s investment isn’t favorable to Nepal. He made the comment in an opinion article published in Nepali newspaper Annapurna Post. Chinese investment is “a hazard” and “inspired by a political decision”—which is different than borrowing money from the World Bank or the International Monetary Fund (IMF), Pokharel wrote. The Chinese Communist Party (CCP) invaded Tibet in 1949, declaring it a part of Chinese territory. The Party has since enacted harsh controls over Tibetans’ way of life and branded Tibetans who consider the Dalai Lama their spiritual leader as “separatists.” Amid increasing suppression from Chinese authorities, some Tibetans have escaped across the border to Nepal for their religious freedom.